i-Que is an interactive, intelligent robot. He has a wicked sense of humour, with lots of jokes and some cheeky sound effects! Watch him move as he thinks and speaks. Play games, see if you can match his 'i-Que' by doing his quizzes, or ask him questions about pretty much anything. ​i-Que has internet safe search filters and by using speech-to-text technology he can understand almost anything you say. ﻿Connect i-Que to the internet and unlock his potential! Play noughts and crosses or memory match, be baffled by brainteasers or try his trivia. i-Que has lots of jokes to tell, you can change his voice and write phrases for him to say. Watch him groove to music in Dance Mode, or use the app to make him move. His blue lights animate in random patterns and his red light indicates when he’s ‘listening’. Simply download the free app from the Apple App Store or Google Play to a phone or tablet then pair with i-Que to bring him to life. i-Que uses speech-to-text software to understand almost anything you say so there’s no need to memorise specific phrases. There are filters in place, which can be added to at home to stop bad words getting through. 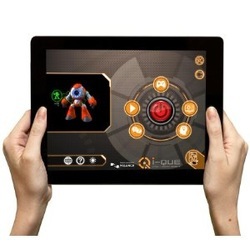 When i-Que isn't connected to a smart device he'll say robot phrases and SFX and can be played with like an action figure with 6 points of articulation. Compatible iOS or Android phone or tablet required.